because the prizes are fabulous!! How fun would it be to get that in the mail! Full color directions for each of the 12 pairs of quilts. Tips and tricks. It has it all. is participating as an on-line store for entering the contest. 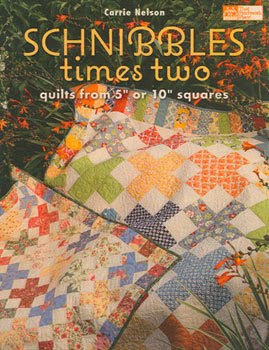 We're inviting you to make any of the quilts out of the Schnibbles Times Two by Carrie Nelson of Miss Rosie’s Quilt Company. You will need to purchase the book (preferably from Quilt Taffy :-), but if you already have it, that's just fine) and use currently available Moda Layer Cakes and/or Charm Packs. Email or mail up to 4 photos of your quilt to me by July 31, 2010 before midnight. Have one of the photos be a shot of the entire quilt and then any other shots you would like. Please do the best photo resolution and lighting that you can. Please do not mail any quilts to me, packages will be unopened & sent back. There is a release that will need to be printed/filled out/scanned/e-mailed back or mailed to me with your photos. Quilt Taffy - 25100 Elk Way - Caldwell, ID 83607. Here are the official contest rules, please read them -- however, we will be doing this online, so you do not have to deliver your quilt anywhere. Quilt Taffy will have a contest to select one winning quilt from the entries submitted to us. This winner will be a finalist in the overall competition. Those are fabulous prizes!! WOW! where is your online store located so i can buy the book to go with the schnibbles contest? thanks! You need to use Moda fabric --layer cakes or charm squares. You could combine fabrics from different packs, but it needs to be current Moda fabric. 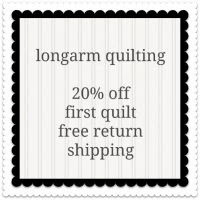 Another question - sorry: how do I know where to find participating quilt shops? Is there an official list somewhere? Thank you! Oh, the prizes make my eyes water - I actually teared up - I am such a case!